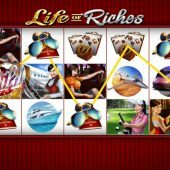 Life of Riches slot is similar in design to another Microgaming slot Deck The Halls. It appears the cloning fairies have been out again! There are 30 pay lines and the premium symbol appears stacked on all reels, therefore giving a clue to its high volatility. The theme is naturally luxury items and the trappings of wealth, with symbols including Lear Jets, Casinos, and Rolex watches. So do these 5 reels of opulence make for a good game? There are single Wilds on all reels too which pay 2x and the top-paying stacked Croupier Girl pays 33.3x for 5-of-a-kind and the Wilds 4 times as much! The lowest sunglasses symbols pay 1x stake for 5. So a full screen of stacked symbols would pay 1000x stake, another clue to the volatility. Life ff Riches offers a free games bonus which is retriggerable. You need to land 3 airliners, presumably full of passengers embarking on a luxury holiday, anywhere in view. This will award 10 free spins with a 2x multiplier. The game is the same except now the Wilds appear stacked too on all reels. The potential best hit therefore is a colossal 8000x stake for a full screen of Wilds and in fact even a decent block of the highest symbol over 3 reels pays a substantial amount. Life Of Riches slot is clearly not an original game and is simply a copy of Deck The Halls with different graphic overlay and music. The theme is also very unoriginal with NetEnt's Mega Fortune and Betsoft's Mega Glam Life just a few of the many games in this style. Having said all this, the formula of this game has proven very popular among the high-volatility thrill-seekers so put simply, it works. So 0/10 for originality and 9/10 for the game design. Will I be seeking to enrich my life? The chance of me hitting the 8000x mega payout is about the same as me ending up on one of those Lear Jets with Donald Trump and cast of 'TOWIE', so go figure.